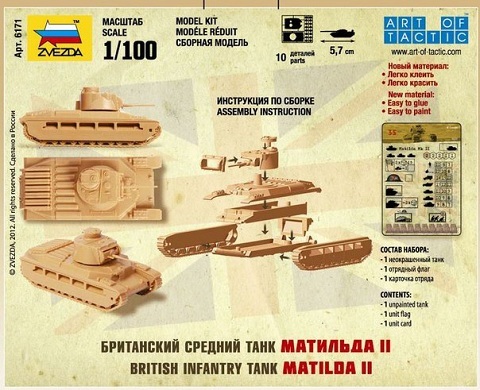 This kit includes one plastic model British tank from World War II. 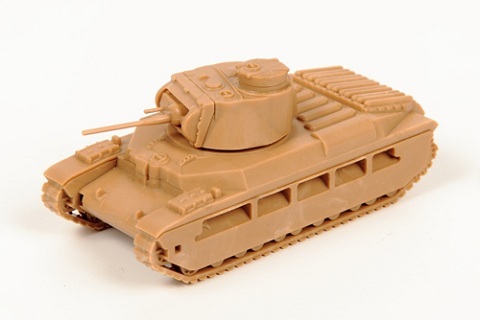 Models supplied unpainted. Assembly required. This “snap fit” model can be assembled without glue. Includes unit flag and unit card for use with the Art of Tactic WWII game. 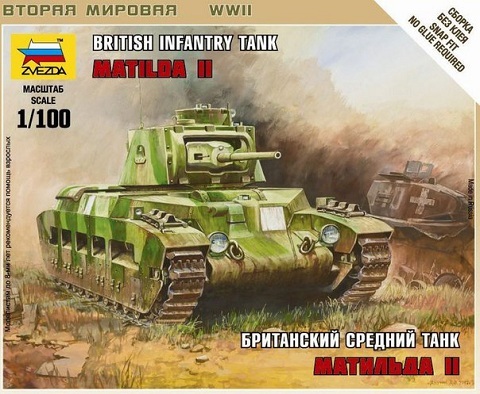 The “Matilda MK-II”, or A12, was developed after Sir Archibald Wavell’s visit to the USSR in 1936, where he was impressed by the Soviet T-28 tank. It would be fielded by the British army during all of World War II, particularly in North Africa and Asia, only gradually being replaced by newer “Valentine” tanks starting in late 1941. Though it shares a name with the earlier MK-I, the later A12 was a completely different design. Nearly 3,000 of this sturdy, heavily-armored tank were produced. The Matilda II was built with extremely heavy armor, which limited its top speed to only about 6 mph (9.7 kph). It was armed with an effective QF 2-Pounder gun, but it suffered from a lack of high-explosive rounds. This forced crews to rely on its single machinegun when fighting infantry. Thanks to its excellent armor protection, the tank was nicknamed “The Queen of the Desert” by British crews.